So, who’s taking up the challenge of writing a 50,000 word novel during the month of November? 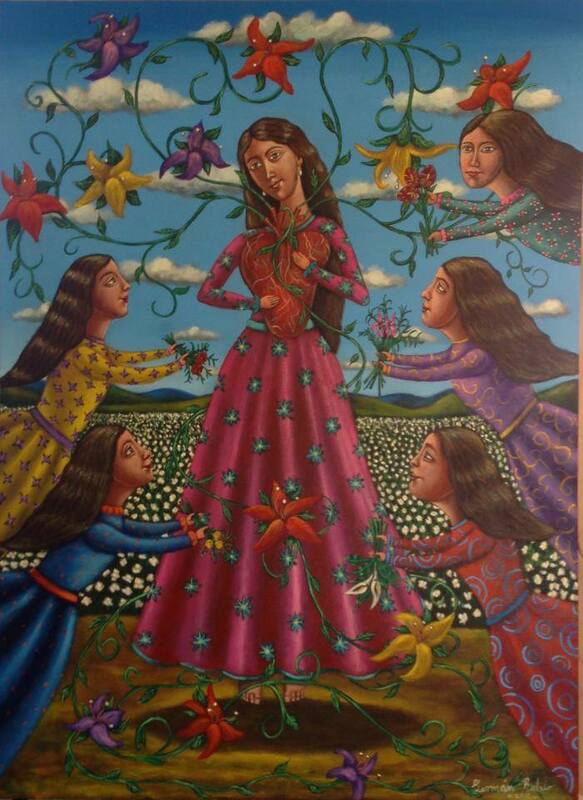 Me, me, me—I have my hand up—I’m working on a novel about three generations of women, three broken hearts and one love potion that goes awry. Yes, I know, it’s going to be a busy month, with Thanksgiving coming up and Black Friday shopping, but what about having some fun before all that starts? Here’s a few “How’s” and a “Why” to challenge yourself during National Novel Writing Month. How about putting those novel ideas, the ones you’ve had for months or years, down on the computer screen? How about resuscitating that shelved 5,000 word piece you started? How about building a daily habit of writing—at least for 30 days? How about going crazy and letting your fingers fly over the keyboard without self-editing judgement? Why write alone? Follow other Nano’s, write in community, and find some writing buddies. Pep talks from Veronica Roth, Chuck Wendig, Kami Garcia and others. Five tips from Nathan Bransford on How To Get Started and other advice. Self satisfaction that you completed a challenge and a badge graphic to prove it. Sponsor discounts on some great deals from Createspace, Scrivener (word processing/project management), and other stuff. Cool web graphics for your social media. A first draft—sh*tty or otherwise— of a novel (at least 50k of a novel, just 10K more to go). Something to show for November other than a turkey. 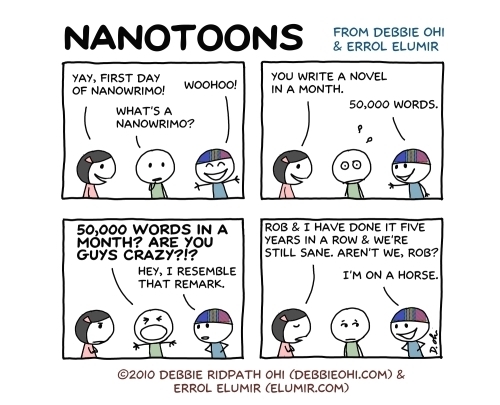 The ire of Nano haters. Ignore them and just write. Don’t look back. Proof that you can commit to writing for 30 days. The incentive to make new goals for your first draft: rewrite, revise, rinse, repeat. You do not get to send your first draft to an agent, publisher, or make it into an E-book. Go through the process, see numero #10, to make your novel viable for beta readers, editors, agents, or submit for an E-book. Good luck to those of you who take up the challenge. It’s been five days since NaNoWriMo ended on November 30th. I’ve been decompressing ever since. Caught up with my reading and now I can recycle the two foot stack of LA Times. I’m doing that to avoid reading my NNWM manuscript. It’s not finished yet and thankfully it didn’t have to be to meet the 30 day challenge. That’s next weeks project. In the last few days I did ‘me’ things: watched two movies, read a book, went to the Tamale Festival to hear Tierra play (a late 70’s band), and attended church service. I also did my mom things like laundry, housework, referee the young adults who act like toddlers sometimes and do minimal dish washing. I hate washing dishes. The Muppets was the first movie that I watched. I don’t have little ones any more but I like Kermie and Miss (or is it Ms.) Piggy. As much as I wanted to like the movie, it just wasn’t happening, the Muppet magic, I mean. It was like reading a book by one of your favorite writers and it turns out to be a dud, it missed the mark somehow. I can’t put my finger on it. The music was as good, the puppetry great, I loved Amy Adams singing and character. It seemed saccharin in some places and I think most of those places involved Jason Segel and the villian. It wasn’t the actors, it was the material-I think. The movie “Margin Call,” is one of those underrated, gone in a couple of weeks, movies. The cast is great and so is the story line. It tells the story of a long day in the life of a Wall Street firm, kind of like Lehman Brothers, trying to survive in the fall of 2008. It’s very well written, a fast paced thriller, and lesson on Wall Street economics all in one movie. As much as I enjoyed the movie I kept reflecting on why Zacary Quinto didn’t get his brows tweezed before the movie. You may remember him from Star Trek. Excellent actor. I braved the cold and joined some friends at the fourth annual Tamale Festival. I had a good chicken and green salsa one, but I have to say, my family makes them better. The chile had it all: spice, heat, flavor, but not overwhelming. The chicken: moist, flavorful, and lots of it. The masa (that’s the cornmeal around it) was the downfall. Too much masa makes for a thick tamale but covers up the good stuff in the middle. Lots of vendors make a tamale with a lot of masa. There is an art to making masa and spreading it on the corn husks (ojas) just right, not too thick not too thin. But I’ll save that for another week. My family makes tamales every Christmas, sometimes at Easter if my mom has the ‘antojo.’ That means when she’s ‘jonesing’ for a tamale. Tierra came on late. An hour late. Did I mention it was cold, brrr, cold? And the wind kicked up. My wool jacket, scarf, and boots were not enough to keep me warm on my foldout chair, without Mexican or Irish coffee, in my hands. When they finally came on the crowd, and me, quickly became disappointed. They talked and talked and then had technical difficulty and on and on. Ten minutes later they played “Memories,” not one of their best but decent. When they got into disco we all went out and danced, mostly to keep our legs from locking up. After that more blah-blah, then Mustang Sally, which isn’t one of their songs, then a cumbia (more dancing for warmth), then more blah-blah. Our group had it and we departed for the first hot thing we could find, which was champurrado (Mexican hot drink with cornmeal). Blah, the vendor had watered it down. Little chocolate, lots of cornmeal-not a good combo. It was like watery grits. Anyways, the weekends over and so is my decompression time. It’s on to the real work now. I need to go jot down scenes on index cards for the ending to my MS (that’s manuscript, not mess). PS> Service was as great as it always is, our Pastor can preach a message. Now here’s the ‘but,’ my less than stellar experiences with parts of my weekend mimicked the service’s music. But I must remember it’s the message that counts.